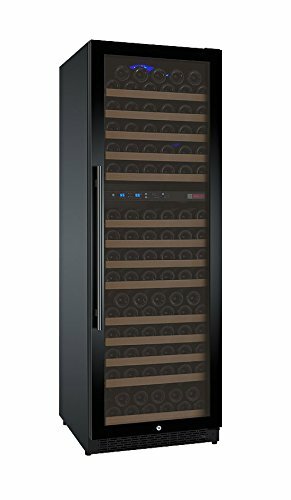 172 BOTTLE CAPACITY: This Allavino VSWR172-2BWRN wine cooler has 12 shelves that can hold up to 11 bottles each and 2 shelves that can hold up to 20 bottles each for a maximum bottle capacity of 172 bottles. 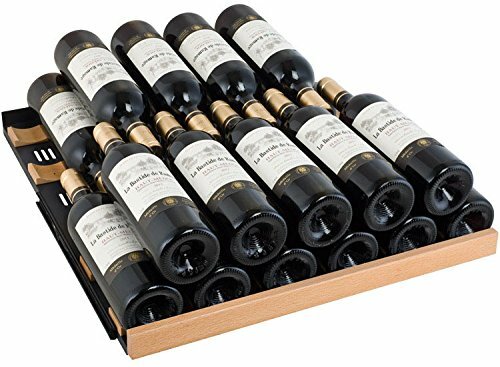 This maximum capacity can be reached with many different bottle sizes and is only affected when adding in larger Pinot or Champagne bottles, making it the ideal wine storage unit for wine lovers with large and diverse collections. 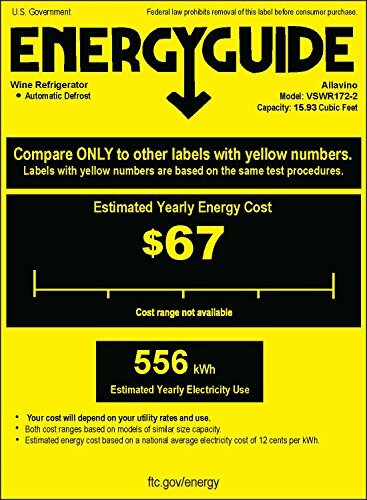 Purchase Allavino FlexCount VSWR172-2BWRN 172 Bottle Dual Zone Wine Refrigerator with Black Door at Discounted Prices ✓ FREE DELIVERY possible on eligible purchases. 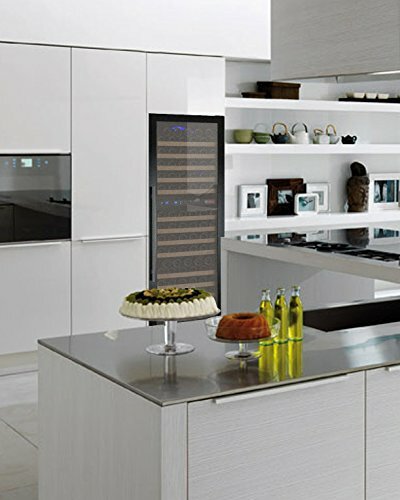 DUAL ZONE TEMPERATURE CONTROL: This wine refrigerator's dual zone design allows you to store both red and white wine simultaneously. You can easily monitor and adjust the temperature settings for both zones using an intuitive digital display with user-friendly push button controls. The upper zone can be set between 40 and 55 degrees Fahrenheit while the lower zone can be set between 55 and 65 degrees Fahrenheit (the lower zone must be set at least 4 degree higher than the upper zone). INNOVATIVE NEW SHELF DESIGN: Get the most out of your space with Allavino's new FlexCount shelving, which is not only thin enough to maximize your wine storage capacity, but strong enough to support the weight of bulk storage without sagging over time. 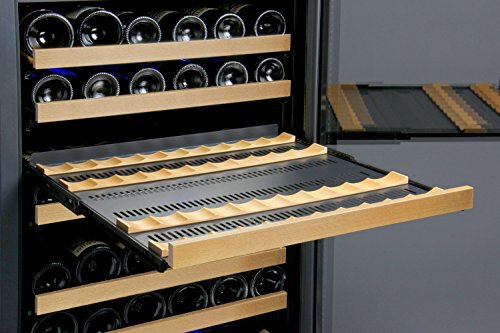 Each shelf features wood slats that cradle your bottles to help minimize agitation to your wine and glides out smoothly on ball-bearing tracks for quick and easy access to every bottle in your collection. 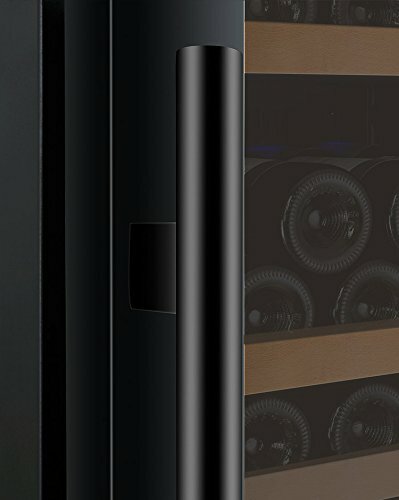 TRADITIONAL STYLE MEETS MODERN TECHNOLOGY: The sleek black cabinet with matching framed glass door and sophisticated all-black interior emulate the elegance of a traditional wine cellar, while innovative features like cool blue LED lighting, fan-forced cooling, and a new advanced cooling system help make this unit a cutting-edge wine storage option. 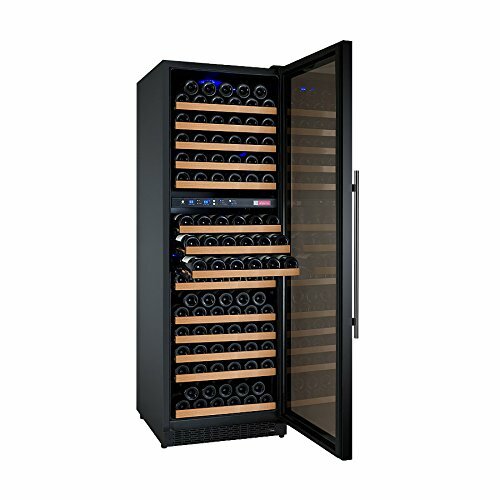 It uses 25% less energy than mange other wine refrigerators on the market, and has quiet and vibration-free performance. BUILT-IN VERSATILITY: This intelligently crafted unit includes a finished cabinet and front-venting design that allow you to use it freestanding or built-in. Build it into cabinetry for a seamless look, or use it as a stylish freestanding addition to nearly any room in your home. This unit comes with both a curved and towel bar handle, letting you customize it to best fit in with the surrounding decor. 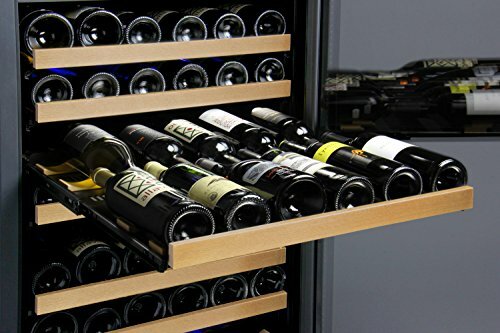 Measures 71.5" H x 23.5" W x 27" D.
Store a truly diverse collection of wine bottles with ease and style in Allavino's all-new FlexCount Series Dual Zone Wine Refrigerators! 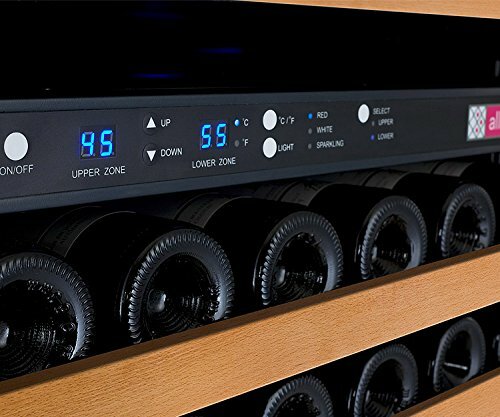 Not only do these wine refrigerators feature two distinct temperature zones that can each be individually adjusted using a user-friendly digital display with push-button controls, but our revolutionary new FlexCount Series wine shelves allow you to easily accommodate bottles of all shapes and sizes. 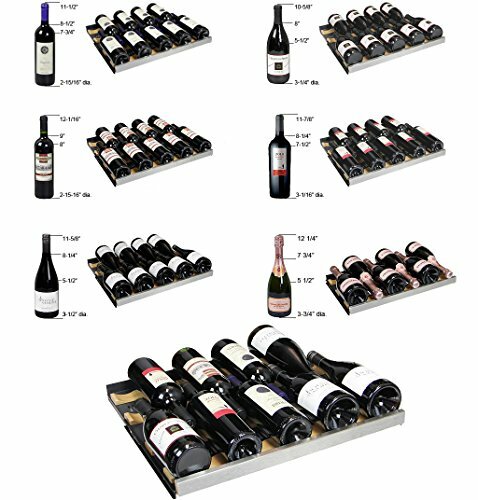 These durable metal shelves have a thin design that maximizes your available storage space, so unlike other wine refrigerators, you will not have to drastically reduce your bottle count by removing shelves in order to fit larger diameter bottles like Pinots and Chardonnays.